Got a good recipe for a hamburger? A recipe? For a hamburger? Who uses a recipe for a burger? You cannot live in America for more than six months and not know how to make hamburgers without needing a recipe. It’s too easy. Well, for someone who cooks regularly, it is the same way for most dishes. You don’t need a recipe to fry chicken or to bake a meatloaf. Besides, it isn’t really a recipe at all, but a process. The hamburger, for instance. You can make them big or small, from ground chuck or ground sirloin. You can douse them with ketchup or mustard. Add Swiss cheese or Velveeta. Cover them in slices of raw onion or smother them with caramelized, sauteed onions. Plop them on a kaiser roll or an onion roll. You even can smother them with bacon and bleu cheese. There are hundreds of variations, yet each and every one is a hamburger. Anyone who cooks regularly knows this: Cooking is not a rote activity, but one that you feel in your fingertips. It is process, not rules. And it is surprising how few processes there are. There is boiling, frying, poaching, baking, braising, sauteing, grilling – a few more: saucemaking, egg separation, dough-kneading, etc. But if you can fry a chicken breast, you can fry a breaded veal cutlet. In fact, if you master the few basic techniques, you can interchange ingredients with complete abandon and come up with a vast menu of dishes. I call it ”modular cooking,” and it means you can build up your own ”recipes” from whatever you have in your larder. Let me take just one example: Linguine Nilsenesca. Linguine Nilsenesca, for instance, is a basic Italian tomato sauce. I start with hot olive oil in a deep frying pan. I add chopped onions, garlic and peppers. Sometimes the peppers are jalapenos, sometimes just blocky bell peppers. When the vegetables begin to soften, add a fistful of dried or fresh basil. It’s personal taste, but I don’t think it’s possible to add too much basil. It doesn’t really matter how much of any of this you use. Different proportions merely vary the flavor. Any proportion will work. If you like more garlic, double the amount. If you don’t care for peppers, leave them out. The whole thing fills the kitchen and the nearby rooms with the pungent aroma of great eating. Family members float into the kitchen hooked by their noses. You cook this mess down until it looks really ugly. The ugliness is important: The uglier your sauce looks at this stage, the better it will taste. At this point, you can add some browned chopmeat. If you don’t want meat in the sauce, leave it out. If chopmeat isn’t enough, add some cooked Italian sausage. When it is all hot and sputtering, douse the whole in a good dose of red wine. It will sputter and fuss and deglaze the bottom of the pan. I usually let the wine just barely cover the mess in the pan. Less will do, so will more. Cook the wine down until you cannot imagine eating what you see in your pot: a dark, purple, gummy conglomeration of ingredients, sticking together like tar. But it is not ugly enough. When the wine is almost gone, add the contents of a small can of tomato paste, stirring it in with a spoon so that everything is covered with a thin layer of paste. Fry it down until just before it begins to burn, stirring constantly. When you have reached this stage, it is as ugly as it’s going to get. Then you save your reputation by adding tomato sauce or canned tomatoes. It doesn’t matter exactly how much, but enough to make the sauce come up red. If you have the time and inclination, you certainly can use fresh tomatoes, peeled and dumped in, instead of canned. Whichever you use, stir it into the mess and smooth everything out. In the meantime, you will have cooked up a mess of linguine in a separate pot. 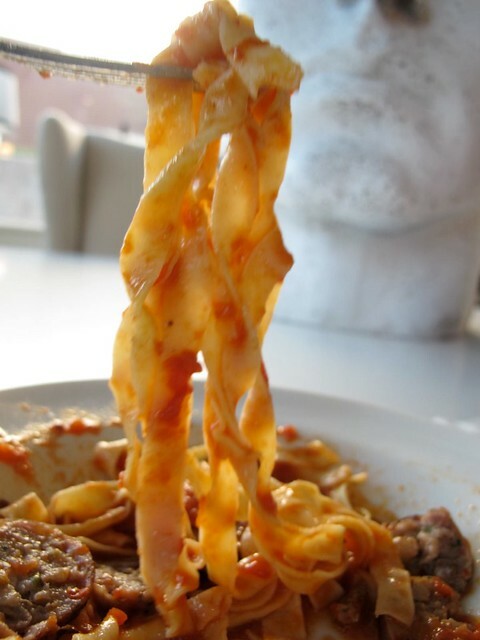 When the sauce is cooked, you simply ladle it over the drained linguine and eat it, with or without Parmesan cheese. This is the best spaghetti sauce I have ever eaten. You now can change anything around: Substitute chicken for chopmeat and you have Chicken cacciatore. For instance, if you make coq au vin, you begin with bacon fat instead of olive oil. You brown your floured chicken pieces in the hot fat and reserve them. Add a bunch of small onions and mushrooms – carrots and small potatoes, if you want ’em – and brown them, along with some garlic, thyme and tarragon. They don’t need to get as ugly as the tomato sauce, but they should turn a nice golden color. Add the chicken back to the pot, and dump in a lot of red wine, enough to cover generously. You can mix the wine half-and-half with chicken stock. Let the pot cook down for over an hour or so, depending on how thick you like your sauce and how soft you like your chicken. Serve the whole thing with baguettes of stiff French bread and you’re in business. Substitute beef for chicken and a coq au vin turns into a boeuf bourguignon. For stroganoff, begin with butter, saute your stew beef and mushrooms, add your paprika and sour cream, slowly, incorporating it slowly to prevent curdling, and serve it over egg noodles. For the chili, you start much the way you do for the Linguine Nilsenesca, but you make sure the peppers are hot ones and you use a blander vegetable oil. If you want something less bland, use lard. It has a distinct flavor, but few Americans retain the taste for it that their ancestors had. And after you add your browned chopmeat, you dump in a dose of cumin instead of the Italian seasoning, and you also add lots and lots of beans. You can use canned beans, or you can use some dried pintos you have cooked up. Canned tomatoes help make a sauce, along with the bean juice. To make this variation, ”mock Hawaiian,” we add some raisins and diced pineapple. Then, it is served on a bed of rice. The process is always the same, get the fat hot and add the meat and/or veggies, get them skizzied, add the spices or herbs, dump in the sauce and cook till done, then ladle the stuff over your starch. * Possible fats: butter, peanut oil, olive oil, ghee, bacon fat, fatback, lard. * Possible meats: stew beef, sausage, ground beef, lamb, pork, chicken, tuna fish, veal. * Possible spices: coriander, thyme, basil, cumin, rosemary, garlic, vanilla, chiles, more garlic, sage, tarragon, garam masala, parsley, etc. * Possible vegetables: potatoes, tomatoes, carrots, corn, peas, beans, pintos, spinach, cabbage, etc. * Possible sauces: gravies, sauces, glazes, soups; made with tomatoes, wines, milk products, bouillons, coffee, bechamels, etc. * Possible starches: pastas, potatoes, breads, rice, noodles, zwieback, grits, etc. When you get the process down, you will enjoy the creative challenges it presents. Like when you have nothing planned, or you weren’t able to get out to the grocery store. You look through your pantry and see what is available. Then you play mix and match, plugging what you have into the basic modular process. That is exactly how Chicken Motocross was invented. * Oil – whatever you have. * Meat – chicken. You even can use canned chicken. * Vegetables – I like onions and diced carrots. Canned is fine. * Seasoning – It doesn’t take much beyond ground pepper, although a small amount of thyme is good, too. * Starch – sliced, toasted bread. It’s not exactly gourmet fare, but it is filling and fast. I have touched on only one modular process here. There are many others, including lower-fat modules. There are salads to be constructed, vegetable dishes, omelet processes. Even breadmaking can be approached this way, once you learn what a basic dough should feel like as you knead it. The process should free you. No longer are you tied to recipes and no longer should you ever worry about failing in the kitchen. A mistake is only a variation. After that, salt and pepper to taste.